For the empanadas: Pre-heat oven to 350° F.
In a sauce pan, place the butter, carrot and onion. Season with salt and pepper to taste. Cook on medium-heat for 5 minutes or until the onion is tender. Turn off the heat and add the tuna and lemon juice, and mix well. In each empanada lid, place 1 tablespoon of the tuna preparation. Close the edges with a fork or your hand. Put the empanadas on a baking tray and brush them with the beaten egg. Bake for 15-20 minutes or until golden. For the coconut rice: Put the rice, coconut milk, butter and salt in a medium pot. Cook on high heat until it begins to dry up. Cover and continue cooking on low until the rice is ready. Empanadas are definitely a people pleaser. They’re versatile and you can use many different fillings and you can even prepare them in advance to save time. They’re a hit at any celebration or a great after-school snack. This recipe is simple and a delicious option for lunch or a quick dinner. 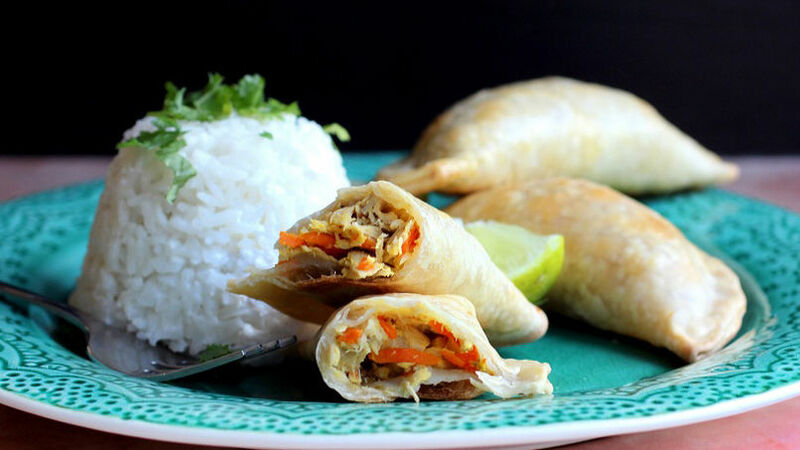 Everyone at home loved these tuna and coconut rice empanadas. They were a success!